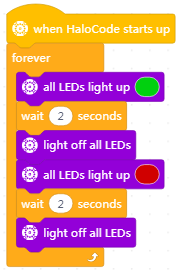 When HaloCode starts up, all the LEDs will light up green, and then go off after one second. Run the script for specified number of times. 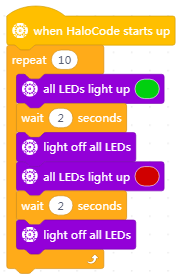 When HaloCode starts up, all the LEDs will light up, and switch between green and red for 10 times. The time gap is 2 seconds. When HaloCode starts up, all the LEDs will light up, and switch between green and red. The time gap is 2 seconds. When HaloCode starts up, if the button is pressed, the LED ring will light in the specified color order. 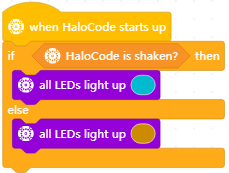 When HaloCode starts up, if it is being shaken, all the LEDs will light up blue; otherwise, orange. When HaloCode starts up, if the button is pressed, the LED animation "firefly" will be played. 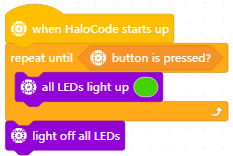 When HaloCode starts up, all the LEDs will light up green until the button is pressed. Then all the LEDs will go off. Stop specified script or scripts. There are three options: all, this script, or other scripts in sprite. When the button is pressed, all the scripts will be stopped.